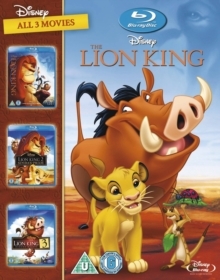 Triple bill of Disney animated features following a naive and curious lion cub as he struggles to find his place in nature's great 'circle of life'. In 'The Lion King' (1994) Simba (voice of Jonathan Taylor Thomas/Matthew Broderick) is excited about being king of the pride but is forced into exile by his evil and greedy uncle, Scar (Jeremy Irons), who wants to claim the throne for himself. Away from his family, Simba meets a meerkat named Timon (Nathan Lane) and a warthog named Pumbaa (Ernie Sabella). In 'The Lion King 2 - Simba's Pride' (1998) Simba's wilful daughter, Kiara (Neve Campbell), escapes her inept babysitters, Timon and Pumbaa, and goes in search of adventure. She wanders into the forbidden Outlands, where she encounters Kovu (Jason Marsden), a young cub who is following in the evil Scar's pawprints. However, Simba is forced to make difficult decisions when Kiara and Kovu fall in love. In 'The Lion King 3 - Hakuna Matata' (2004) the original story is told from Timon and Pumbaa's perspective. When Timon decides to explore the world, it's not long before his path crosses with that of Pumbaa and they become good friends. But their plan to find a new home is forgotten when they come across a young cub called Simba and help him save the Serengeti..